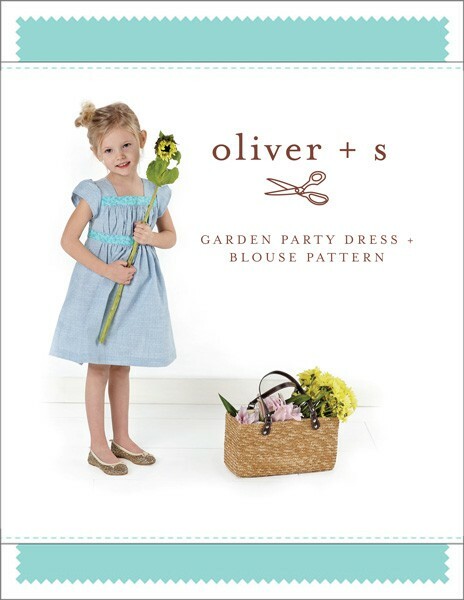 Share your photos on Instagram with the hashtags #gardenpartyblouse and #oliverands. This pattern offers all sorts of creative options. 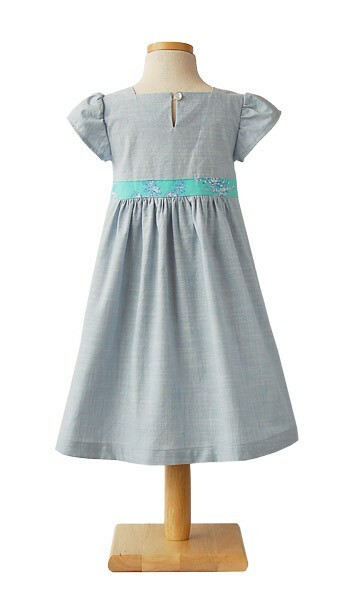 You can choose to make either a sweet everyday dress or blouse or the ultimate fancy dress or blouse. Both views feature a pretty shirred front bodice, gathered skirt, and a keyhole back-neck opening. 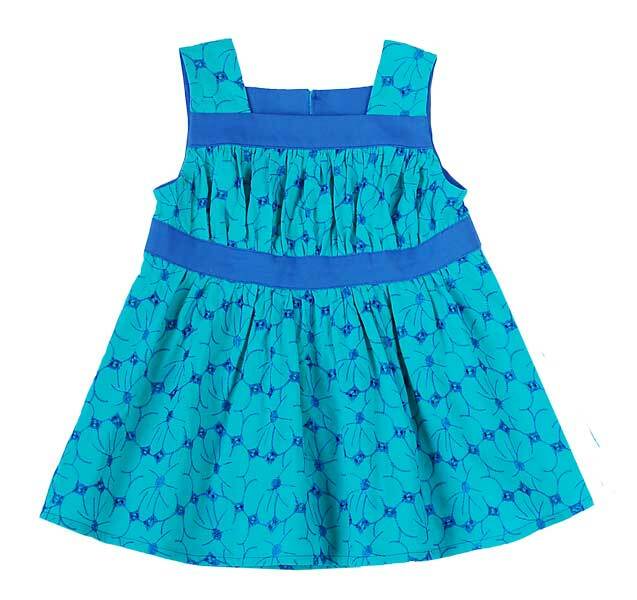 The dress version includes cute cap sleeves while the blouse option is sleeveless, but you can mix and match to create a variety of darling styles from one pattern. 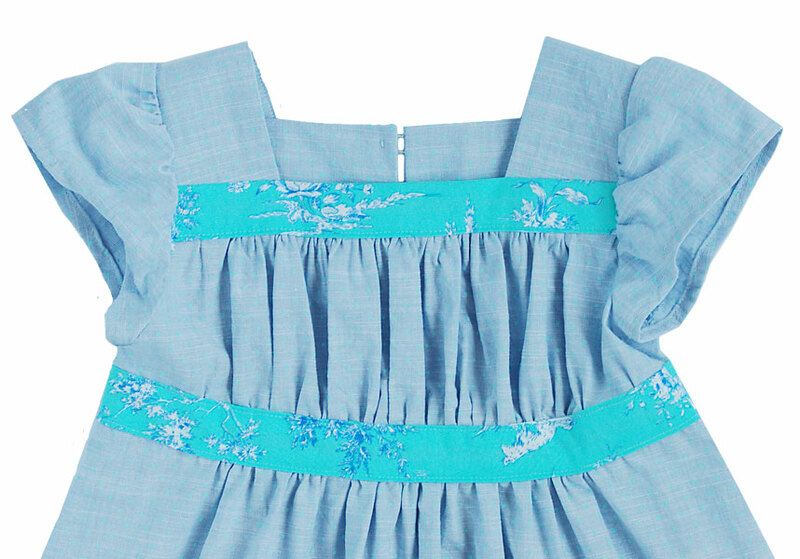 This pattern is also perfect for embellishing with ribbons, embroidery, or even smocking. After successfully sewing this pattern, you will have developed the following skills: gathering, curved seam, flat-set sleeve. Coordinating thread, one 1/2" button, featherweight fusible interfacing. Dress Length* 18" 19" 20" 21" 22" 23 1/2"
Blouse Length* 12 3/4" 13 1/2" 14 1/4" 15" 15 3/4" 16 3/4"
Chest 26" 27" 28" 29" 30" 31"
Dress Length* 25 1/4" 27" 28 3/4" 30 1/2" 32 1/4" 34"
Blouse Length* 18" 19 1/4" 20 1/2" 21 3/4" 23" 24 1/4"
I'm a quilter and have only made fairly basic dresses for my daughter, but this pattern caught my eye for a special occasion she has coming up. I made a "test fit" of the blouse to see if the fit was right and if I'd be able to pull it off. I'm happy to say I didn't need my seam ripper once! A miracle! I had to look up a few things, like understitching and the button closure, and did end up doing a hook and eye instead, but overall the pattern was written well enough that this intermediate beginner could follow. I DO wish there was a simple lining pattern piece included. I would like to try using eyelet fabric over a colored lining but don't want to gather both layers, so I'm trying to draft my own lining. Yikes! I was asked to make 5 flower girls dresses in same fabric but different patterns. One of the Moms picked this pattern for her daughter. I was reluctant at first because I was not sure that fabric the bride had chose would look good ruched, but it actually turned out OK. My only suggestion is that there are much simpler ways to do the front panel that I will try to amend if I ever make this again. Also I would have done a full lining versus facings. I did line the sleeves with the same contrast fabric as the bands. And I used an elastic for the button loop inserting it before the back seam stitched. Overall it is a darling dress and the instructions were clear even though the methods a bit convoluted as noted above. I purchased several patterns but have chance to sew only the garden party dress. It was veey nice expeeince and I learn a lotfrom there specialy with digital pattern. 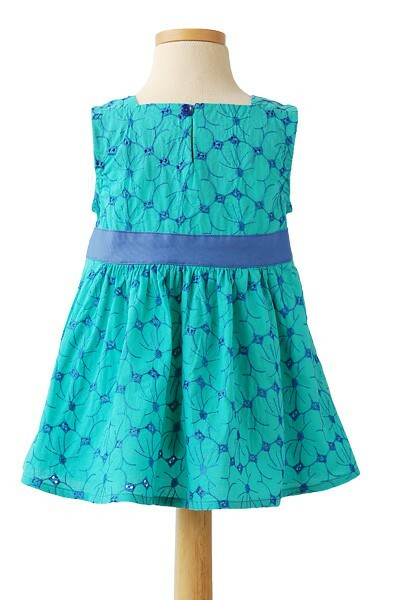 I was happy with the dress and went on for the same pattern with aller soze range for my youger daughter. Another challenge is find fabric. I do not want ro spenda lot of money on fabric so I am usually wait for sale, however it is not alway easy to find beautiful fabric at reasonable price. 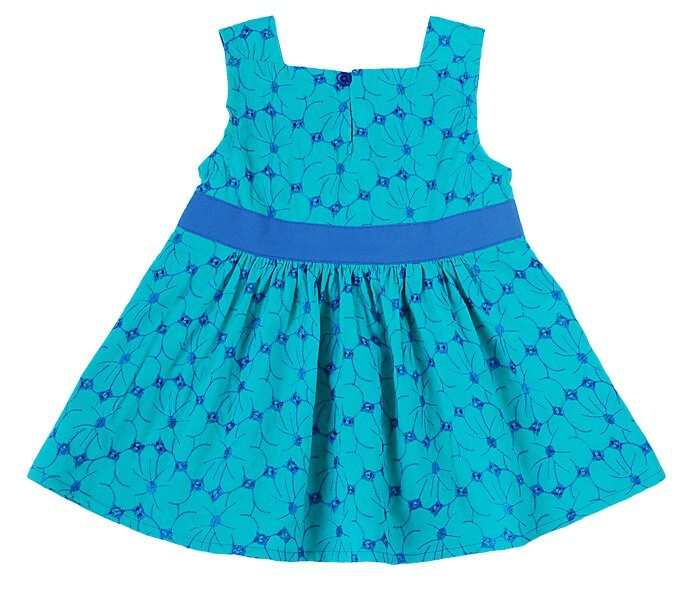 I bought this pattern and made my first dress from it several weeks ago for my niece's 2nd birthday. I made the 2T and the size was just perfect for her--it fit like a dream! The design is so cute, and the sleeves are darling. Construction-wise, I thought this was appropriately rated. I had a bit of trouble with the back opening, where apparently I cut a little too close to the stitching. Even so, I still wasn't able to get it to lay perfectly flat without some wrinkling, try as I might to get it to behave. Ultimately, I decided I could live with it, but this was definitely the trickiest part of the pattern to me. I would also advise newer sewers to make sure their gathers are lined up vertically before sewing the contrast bands on--mine list ever so slightly to the right! It's just a detail I overlooked, but I don't think it's too noticeable while it's being worn. It seemed this dress went together sort of unusually, but if you follow the directions, it all comes together very nicely, so don't despair if it seems a little weird while you're sewing it. Just read the directions several times for every step to make sure you're clear on what it's telling you to do, because it's not always intuitive--but it does work in the end! I was not a fan of the thread-loop closure. It kept popping open during wear. Luckily, the dress fits so well, there was no danger of the dress falling off, but it was still super-frustrating. I think I'd prefer a snap or more traditional button and hole on clothing for an active toddler. Overall though, a beautiful dress, and I will definitely use the pattern again! It was my first time to make a cloth and I'm beginner. By using this pattern, I learned a lot of technics. The instruction is well written and very easy to understand. 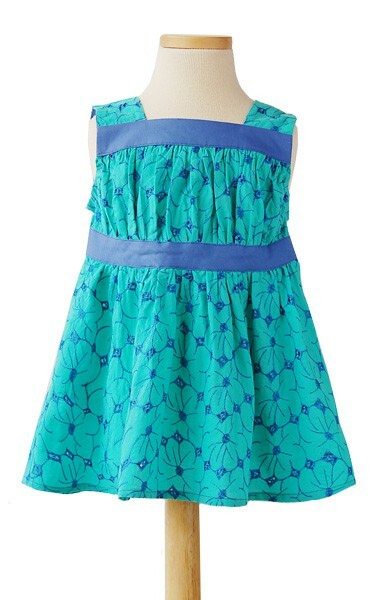 I keep using Oliver S.
I sewed 4 matching christmas dresses for 4 cuties this past christmas (age range: baby to six yrs). I love how the pattern has you construct the dress (the front yoke part I couldn't picture at first, but I followed the directions and was impressed at the end). The pattern/directions were better than any big name pattern company I've sewn from in the past. I was a little disappointed that long sleeves was not an option given in the actual pattern. However, I successfully drafted long sleeves from the short sleeve pattern pieces and was pleased with the results. I chose the pattern size for three of the girls based on their chest + waist measurements (mainly their chest if the two diverged a bit, since the pattern seemed forgiving in the tummy area). Since their chest and waist measurements resulted in a smaller size than their height measurement would have put them in, I just added length to pattern pieces 6+7. I added to each of the pieces the difference in the finished dress length sizes of the two sizes (the finished dress length for the size that their height would put them in minus the finished dress length for the size their chest would put them in). The forth dress was for a baby less than six months, so I did my best scaling down the pattern pieces (since the pattern begins at a size 6 Month). I did this task by making note of where and how much the other sizes differed from each other. In the end, it worked and I was happy with the results. With the addition of the long sleeves, I think the dress would have looked a tad better a little longer. This is NOT the pattern fault by any means. I should have payed more attention to where the bottom of the dress was intended to hit on the leg and thought about how it would look with the altered sleeve length. With that being said, I think the length is perfect for the short sleeve dress that the pattern is drafted for. Still, my altered long sleeve dresses were all very cute in the end! I can't wait to make some more dresses with this pattern! I already have some in mind. 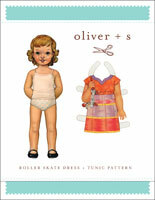 I LOVE Oliver + S patterns. They are a joy to sew! This pattern is quite easy to make and comes out looking so good. This will look great on any girl, and works with so many different fabrics. The sleeves are just right, too. Loved making this for my granddaughter. This is probably the 6th oliver & s pattern I've made for her and all have been a smash hit! She needs to grow into this, but by Labor Day it should be a perfect fit! I have made this 4 times (3 sleeveless and 1 flutter sleeved) in the past month, two each for my two granddaughters and it is a Wonderful pattern, as always from O & S. It is exceptionally drafted and the instructions are excellent. I look forward to new patterns releases and snap them up at once whenever they come out. LOVE, Love, love the aesthetic and the quality of the patterns. I absolutely LOVE this dress! I had a completely different idea of how this dress would be constructed; however, now that I have gone through it, I'm amazed at the simplicity, ease and detailed construction! It really creates a beautiful finished product and there are so many different options with fabrics and views for this dress. I have not used an oliver + s pattern that I have not loved and the garden party dress is no exception. The directions are so detailed. I am a seasoned sewer but I think the patterns are so much easier to follow than any from big name pattern companies, so much so that a novice sewer should not have too much difficulty. I really enjoyed making this dress. 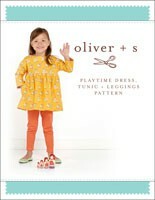 Every oliver + s pattern I've ever worked with is thorough and extremely easy to follow. This dress was no exception. I ended up making 3 of them - I have two daughters and I made the wrong size for one of them so I had to make an additional one. By the third dress I had the pattern down pat and it only took about 2 hours to make from start to finish. I do have one complaint - it appears the back of the dress is a little longer than the front. It's not terrible but it is noticeable to me. I could have attempted to pin the dress before sewing but there is little chance my 1-year old would have stood still long enough for me to do that. Even with the length issue, I still love the dress and pattern. I made the blouse, view B, and was so happy with both the process and the final result. The only other "real" pattern I've sewn was the Oliver+s sun hat. Both have been very clear and provide enough support for those still learning about sewing. The best thing was that I learned techniques, like sewing a basting row of stitches to get an even fold line, that I will be able to apply to other sewing projects. I love how with every Oliver + S pattern I sew I feel a little bit smarter and armed with new sewing tricks up my sleeve that can be applied to a myriad of sewing ptojects! 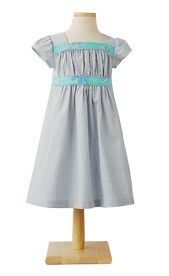 I just sewed this Garden Party dress for my soon-to-be 7-year- old to wear for her tea-party themed celebration. She just loves it. The directions were clearly written and easy to follow (easy enough for this sleep deprived mother of three to follow in the midst of many distractions). I especially liked the tip to sew a line of basting stitches to act as a folding guide to create perfect hemlines. Sewing this dress was a delight. Everything went together effortlessly. Instructions were explicitly easy to follow and the finished dress was just beautiful.The fit was very good. I will be making this again in different combinations of fabric. I made it for my 5 year old grand daughter and she is very happy to wear it. I just started learning how to sew. 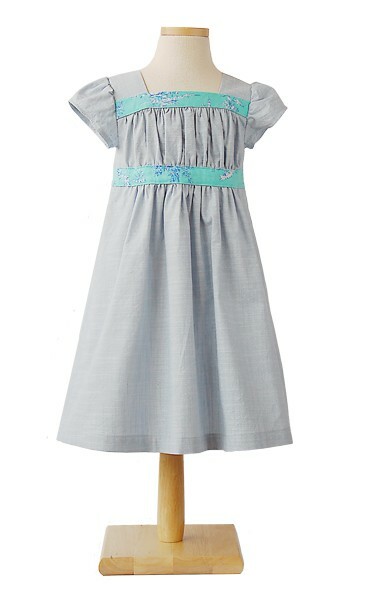 The garden party dress is the second oliver + s pattern that I have worked with. The instructions were clear and easy to follow. The end result was great. I plan to make more uses out of this pattern, with different materials. I am mostly a self taught sewer and had no problem following the instructions. The pictures for the somewhat confusing parts are a great help! So nice to find a pattern that is true ti size and beautiful simple detail. Love that it can be a blouse or dress. You can dress it up or down. Love it! 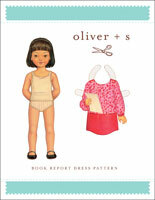 Discussion on the digital garden party dress + blouse sewing pattern from the Oliver + S Discussion Forums. Find and share more photos on Instagram using the hashtags #gardenpartyblouse and #oliverands.